With multiple features and potential applications, this all-in-one Advance Tabco CRU-60R stainless steel uni-serv speed bar will serve as an essential part of your high volume restaurant or bar operation. A 30" x 15" x 12" insulated ice bin is featured on the right side of the unit and boasts a 98 lb. capacity, while a recessed drainboard allows for glassware storage. 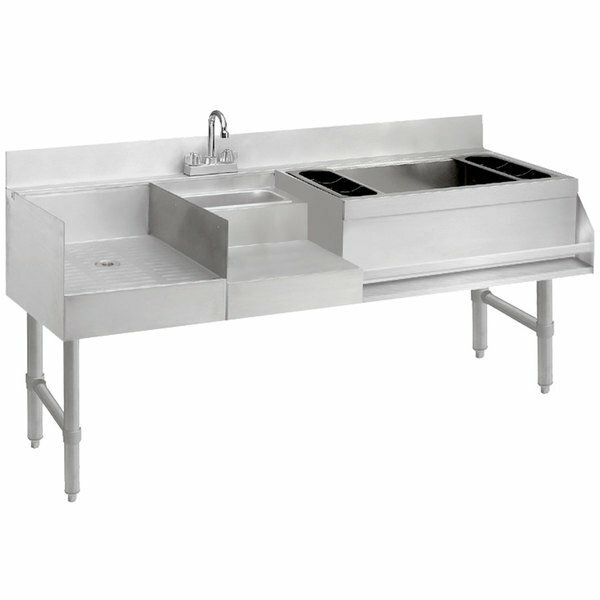 Additionally, a 10" x 14" x 10" dump sink with splash mount gooseneck faucet sits conveniently behind a dual blender and mixer recessed station, complete with hidden 15A/120V duplex outlet beneath the shelf.